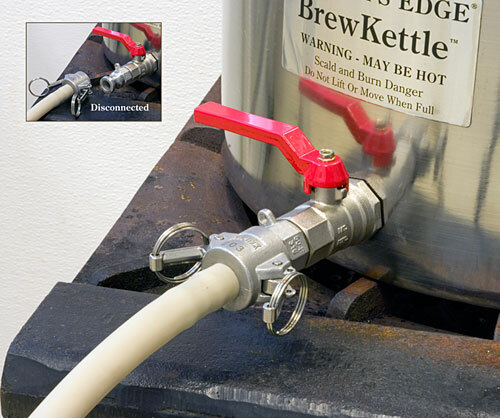 Brewer's Edge makes an affordable line of stainless brewing pots in sizes ranging from 32 to 76 quart. All features the weldless patented KetttleValve for easy leakproof installation and easy attachment of 3/8" male NPT filters and other accessories on the inside. The larger 60 and 76 quart sizes also feature 1/2" female NPT ports, so you can attach a thermometer or other accessory (not included). Which to Choose? Choose the 32 quart BrewKettle if you plan on brewing on your home stove only, while 40 quart and up are great for using with outdoor burners. If you want to get started in extract brewing but want a pot that will have plenty of capacity for all grain brewing, get a 40 quart or larger size. All feature our one year guarantee.